When it comes to Bible Journaling, one of the questions I get asked the most is "what kind of journaling Bible do you use?" ​Well, I actually have several different Journaling Bibles as well as sketch books and journals which I use to worship creatively. And recently I was sent the NJKV Journal the Word Bible - Large Print, to use and review, and give-a-way. So today, I'd like to share with you my impression of this particular Journaling Bible. ​First, the translation of this Journal The Word Bible is NKJV, or New King James Version. To quote Wikipedia, "​The aim of its translators was to update the vocabulary and grammar of the King James Version, while preserving the classic style and literary beauty of the original 1611 KJV." All that being said, I find the NKJV translation very easy to read and understand. ​Next, and another attribute that I like is the single-column format. This is different from the other journaling Bibles I use, and I found that I liked it quite nicely. ​But one of this Bible's format's that I really love is that it is Large Print. 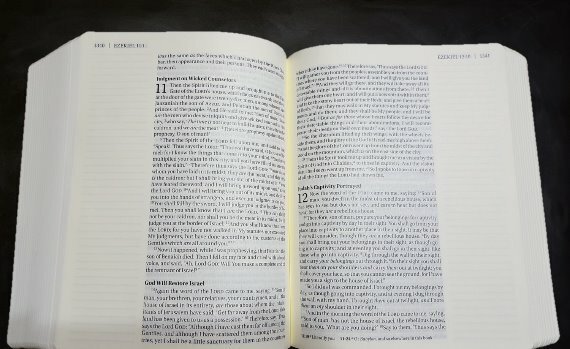 Most journaling Bibles have a small print to allow for the blank margins on the page which creates the space for journaling, note taking and doodling. But Thomas Nelson has beautifully combined Large Print and generous journaling space in this Journal The Word Bible. ​The trade off with having Large Print and journaling space is that this Bible includes 2,000 pages to journal, draw, doodle, study and worship through creativity. Yes, 2,000 pages. This is a lot more journaling space than another brand of journaling Bible I have which has the same page dimensions but smaller print, and thus 600 less pages. ​And then there's the cover. The version I received is black hardcover, and I love it! You might be wondering, does the cover make a difference? Well, I think so. Many are soft and flexible, like my everyday Bible, and several Journaling Bible have beautiful printed covers, but this black hardcover is another blank space for me to be creative and custom letter to truly personalize my journaling Bible. Now for the fun part. I would love for you to have one of these wonderful Journal The Word Bibles. And a set of Soul Inspired Bible Journaling Templates / Color Your Own Book Marks too. 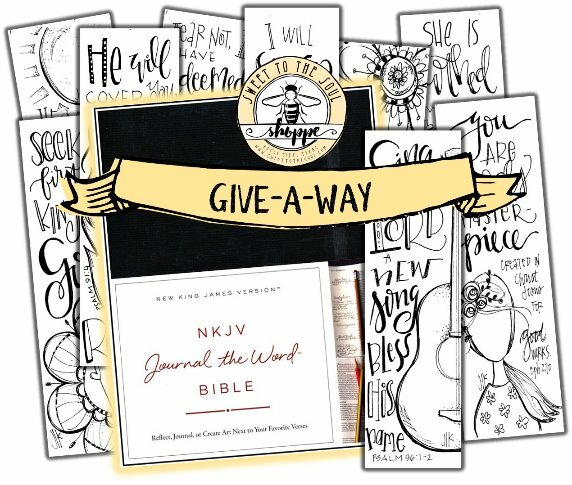 ​One lucky winner will receive a FREE Journal The Word Bible + Journaling Templates. ​Another winner will receive the set of Soul Inspired Bible Journaling Templates. And a 3rd winner will receive both Soul Inspired Christmas Template and Ornaments Kits. ​I would love to hear about your favorite Journaling Bible and supplies. Thanks for stopping by today! 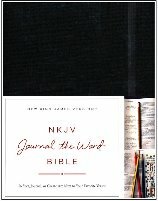 ​Disclaimer: A free copy of the NKJV Journal the Word Bible was provided in exchange for an honest review of the product. Affiliate links are included in this blog post. As a special THANK YOU, I'd like to give you this coupon for 25% your total purchase from Sweet To The Soul Shoppe, now through December 31, 2016. ​Visit our shoppe to see our full line of scripture prints, Bible Journaling templates/ color your own bookmarks, Soul Deep Scripture Journals and more! 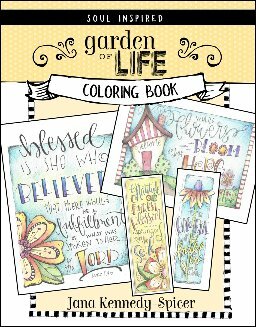 ​Coupon is good on any purchase including our just released Coloring Book - Garden of Life. What a cool Bible to journal in, and your coloring pages, templates and ornaments are so beautiful! Thank you to everyone who participated in our giveaway.